According to Barbour, almost a third of workers have been bullied and half of women, and a fifth of men, have been sexually harassed at work. Bullying and harassment is offensive or insulting behaviour that makes someone feel intimidated. It may involve the abuse of power by one person over another, or it can involve groups of people. Bullying at work can take shape or form in many different ways. It can be verbal or written and may include the circulation of photographs. Barbour’s report states 47% of employees reported having experienced unreasonable treatment over the previous two years. Sources of help and information. Fill out the form to download Barbour’s free employee factsheet and find out more. 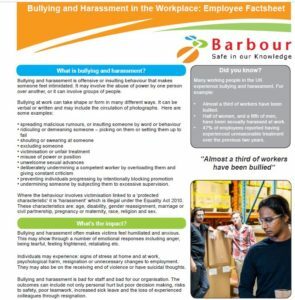 Barbour download: Bullying and harassment in the workplace According to Barbour, almost a third of workers have been bullied and half of women, and a fifth of men, have been sexually harassed at work.